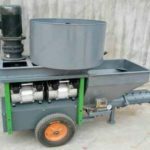 Buy sand blasting machine for sale, sand blasters for sale, industrial sand blasting machine with high quality at a much lower price in Yugong Machinery now. The equipment can be both wet sand blasting machine and dry sand blaster. When you purchase, you need to tell us which model you need and we will equipment you with the accessories for the model. 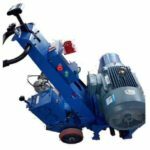 Of course, the sand blasting machine for sale in our company are different in diameters, heights,volumes and the work efficiency. Refer to the major parameters table below to select the size you need now. Or if you have any question,please fee free to consult us, we have been looking forward to serving you. 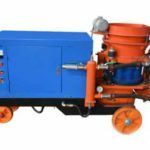 Sand blasting machine is a kind of rust removal equipment that enables various kinds of abrasive materials to be sprayed to the metal surface by air pressure. The blasting sand sprayed to the metal surface grind on the metal surface, remove the impurities and oxide from the surface and increase the surface area which can improve the surface adhesion of the coating and the quality of coating. The sandblasting material can be river sand, yellow sand, steel shot and sand, cut pill, brown corundum, emery and quartz. The jet technology can be divided into three types according to the injection way, the press-in type, suction types and centrifugal type. Press-in dry sand blasting machine. It is driven by compressed air, and the working pressure established in the pressure tank by compressed air will push the abrasive material into the sanding pipe through the sanding valve and then injection through the nozzle to the processed surface to achieve the expected processing. Compressed air is both the power of supplying blasting sand and the acceleration power of jet in this model. 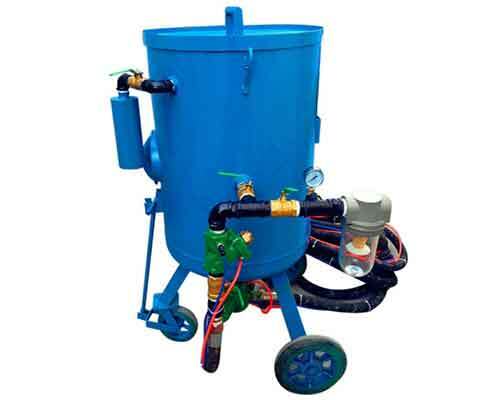 The operation principles of the suction type sand blaster is very similar to that of press-in sand blasting machine. 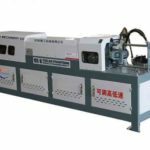 The different is that the purpose of surface machining is mainly achieved by the negative pressure created by the high speed motion of the airflow in the spray gun. 1.Simple operation. 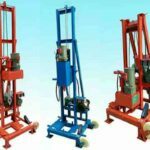 Ordinary workers can operate the machine after half an hour’s training, and advanced automatic control system can prevent workers from operating by mistake. 2.High production efficiency. A sand blasting machine can spray 5 to 30 square meters of metal surface per hour depending on its different sizes. The daily workload is equivalent to 50 to 80 skilled workers’ sandblasting workload. 3.High sand blasting accuracy. It can remove very small and hidden flanges, isn’t subject to object shape restrictions. The qualification rate is high and the sandblasting quality is stable. 4.Strong practicability. It can remove the edge of small rubber and plastic alloy products, brittle plastic products and magnesium alloy, zinc alloy and aluminum alloy castings with complex structure and any shape. 5.If you use a sand blasting machine to remove rust. The surface won’t be damaged. At the same time, the appearance of the product will become more beautiful and the service life will be increased. 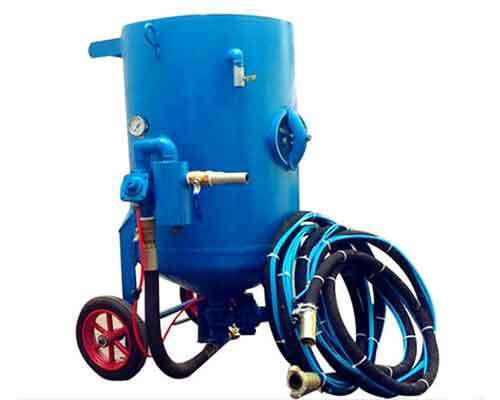 A sand blasting machine usually consists of a sandblast pipe, gun holder, sandblast gun, pressure gauge, air intake ball valve, air intake port, sand valve handle, observation port, quick joint, filter, etc… The pressure gauge is mainly used to control the pressure in the pipeline to ensure the strength of sandblasting. The larger the pressure value is, the higher the speed of jet floe and the efficiency of sandblasting. 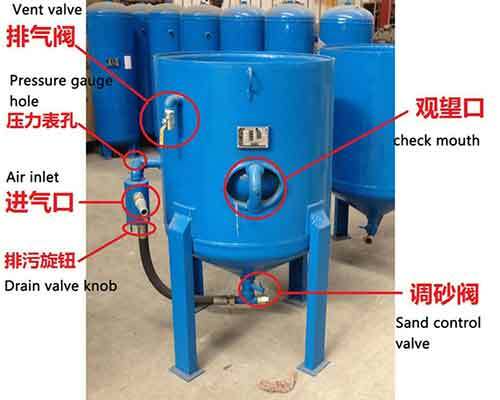 Adjusting the connection time of sand valve and air outlet valve can control sanding and blowing time to ensure the effect of sand blasting. Sandblasting cleaning is a very widely used process in mechanical manufacturing. The parts that need forging, casting, heat treatment and surface treatment should be cleaned by sand blaster to remove the oxide, sand, old coating, molten salt heat, rust, etc. Sandblasting technology is widely used in the fields of ships, bridges, water conservancy projects, mining machinery manufacturing, petroleum, chemical metallurgy, port construction,light industry, aircraft manufacturing, locomotives and vehicles, instrumentation, precision manufacturing and electronic industry. It is an ideal method to clean large area of metal surface before coating, which can enhance, polish and sculpt non-coated surfaces. 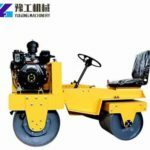 As a sand blasting machine manufacturer with many years of production experience, we can provide our customers with the best machines and services. 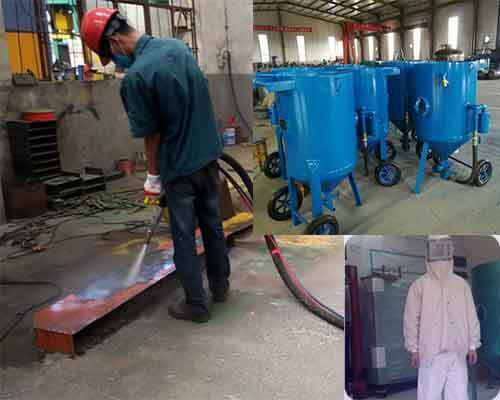 The sandblasting technology of our factory was introduced from Japan. Then our engineers designed the series of sand blasting machines combined with our national conditions and international standard. 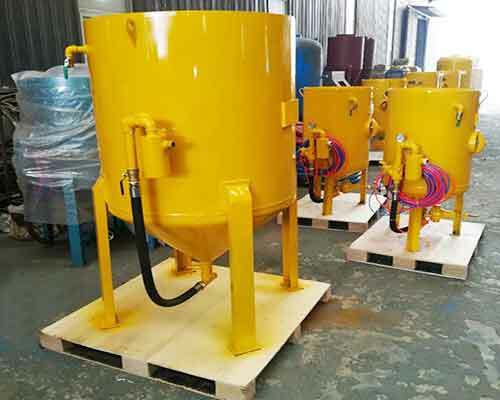 Compared with other similar equipment, the sand blaster for sale in our factory can increase the working efficiency by 30 percent, abrasive materials and energy loss reduction by 20 percent. 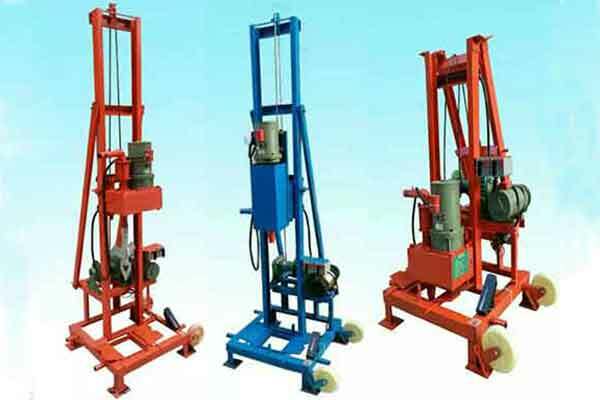 In addition, our machines are absolutely safe, reliable, simple in structure and easy to operate, maintain. 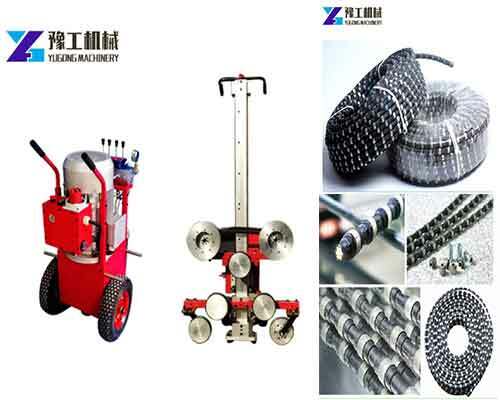 You can also buy floor shot blaster which is similar to sand blasting equipment but mainly used for road construction and some other popular machinery, such as, mortar sprayer, water drilling machine, wire saw machine, road roller machine, road marking machine and so on. 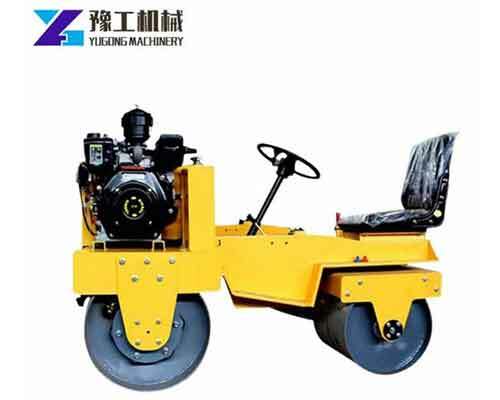 If you are interested in our machinery, please don’t hesitate to send us email for more details right away.